Everyone has their present now…. Baby blankets. These are made out of knitting yarns. They are sooooo soft and thick. I think there are more to come. Rugs and baby blankets delivered. I am ready to start again. Now that the studio is tidied up and looking fresh for the new year I am eager to begin. I have the 60″ loom warped and ready for more rugs similar to the red one in the picture above. Lots of Pendleton Woolen Mill selvedges to begin new rugs plus material I have added to the stash over the years. I also want to get the 30″ loom ready for more projects, the sewing machine ready to do some quilting, things done on the knitting machine as well as art projects too. I have a fiber show to get ready for in May which will take up a lot of my time. I am working on a tapestry in that department. The weather is cold here and winter is a great time to work on inside projects. Looking forward to the warm spring air of spring though so I can open the big doors of the studio (which is a former garage) and let the fresh air in. Gas and wood heat is great for warmth but so dry. I hope you had a wonderful Christmas season and are having a good beginning to your new year. May the Lord bless you with many things for your hands to do and keep a happy heart within you. The Cranbrook loom is set for more weaving, rugs to be exact. These will be rag rugs without fringes. I like to do hems. The rugs will last longer and look nice for many years to come. The first one is of a plaid cotton flannel. The second is of Pendleton woolen selvedges from their blankets. Pictures to be added later. The next 2 will also be that only in different colorways. These will be added to my inventory and given as gifts or sold. I love doing rugs on my Cranbrook. The years have gone by quickly and many changes have taken place since my last post. I have remarried and moved. Gained a great studio space for my many passions, painting, weaving, knitting machines, quilting, etc. and have settled(?) into a life of retirement. I acquired a used (1976 60″ Cranbrook loom and have taken Jason Collingwood’s rug weaving “3-end Boundweave” class. So now my studio includes 3 looms, 4 knitting machines, 3 sewing machines, watercolors, and acrylic to round out my creative endeavors. Oh yes, there is tapestry going on over there and some embroidery in the house, did I mention the spinning wheel and the stash of wool waiting to be spun? Maybe I’ll work some of that into that tapestry…………. huuuummmm. What is going on now? There are dish towels on the small loom in a Rosepath pattern, just began those yesterday. Tapestry ready to begin, wound the balls of wool last night. Getting ready to wind the warp for the rug loom since I just took off the last rug of the last warp. And finishing the warp that my granddaughter started for some wall hangings for her room. The embroidery is on hold for now. I will work on that while my hubby is laid up from his surgery which takes place this Friday. I am sure your lives have taken on new priorities over the past few years also. If you would like to share some of that I would love to hear your stories. I finally figured out how to add some of my paintings to the Gallery page. It still needs more tweaking but I am gaining ground. 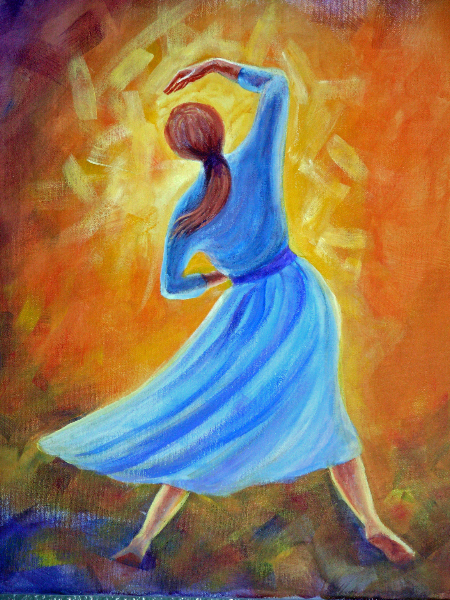 One of the newest paintings is the “Worship- Dancing Into The Light”. I haven’t figured out why the title didn’t post under the picture yet. It is done in acrylic, a new medium for me so I am still exploring with the application and textures I can achieve with it. I have finished another acrylic to go with this one called “Prayer – Lifting Up The World” and will post it upon downloading of the picture. Hope you enjoy the additions. Let me know if you have any suggestions to make this a better blog. Thanks for looking. A beautiful day to paint a picture. This one is in acrylic. A new medium for me, but I am really enjoying the possibilities it has to offer. Done last summer following a wonderful trip to California. 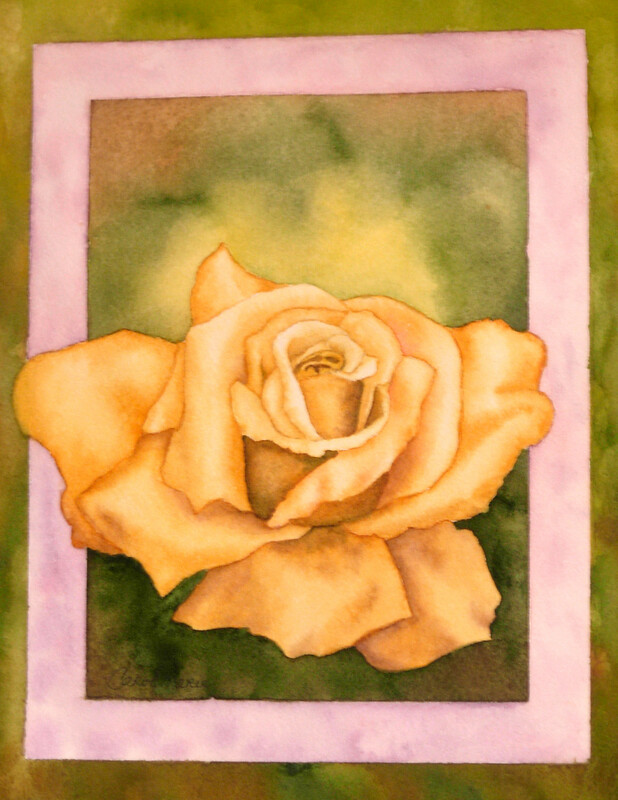 This painting was completed at a workshop with Joyce Green in Moscow Idaho this last weekend. She is a very good teacher and very helpful to all her students. I would highly recommend her to you for a workshop. Look up her website at joycegreen.com. She comes from the Boise, Idaho area and does beautiful wild life as well as other things. 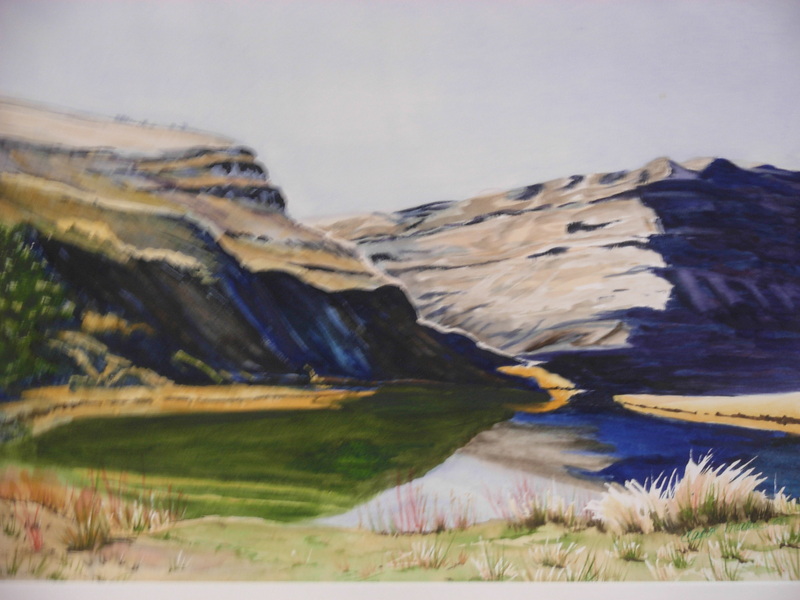 This workshop was presented through the Idaho Watercolor Society and I was more than ready. I learned I am a depression artist (which means I need to use more pigment in my washes). So, in my future paintings I will work on that with more determination. I had a wonderful time and met some old and new friends. The best part of any workshop is, of course, being with other artists and learning from each other. My hope was this experience would ignite a spark in me, at least enough to get the brushes busy once again. So far it has been successful in doing just that. I have been wanting to take on this picture for a while. The challenge being the atmosphere of this place. 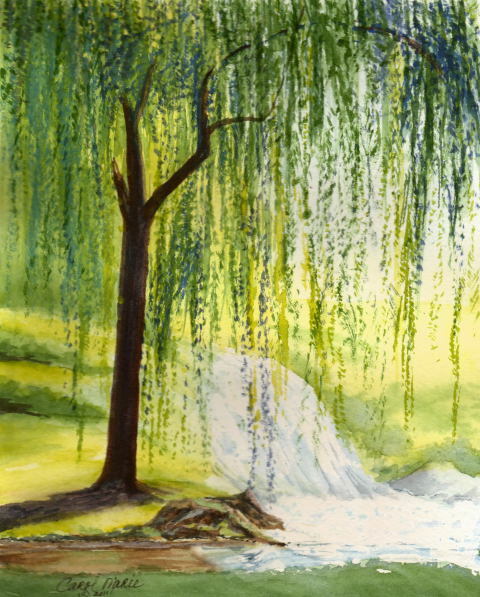 So serene with the brook, the waterfall and the wonderful sound of the willows dancing in the breeze. A quiet retreat in the middle of the plains of Montana. Yea!!! It’s finally done. My newest watercolor landscape. A long time in the making this is my vision of a high mountain meadow. I really enjoyed doing this painting. One of the new things I did was use several pictures of the various elements to create the overall image. The most exciting experiment was the rocks. Another goal was to leave you with the feeling of a cold crisp morning in the great outdoors. Did I achieve my goal? I love being in the mountains feeling the cool fresh air, smelling the pine trees as they gently sway in the breeze. Listening to the trees make their music and the chatter of the squirrels letting the residents know there is a stranger in their territory. Maybe I’ll go for a drive this weekend. This painting and others will be on display at the June show of Bridging the Arts at the Sage Main St. in Lewiston Idaho. There will be watercolor, oil, acrylic and other media in the show as well. Watch for our ads in the Arts and Entertainment section of the Lewiston Morning Tribune. Hope to see you there. This has been a favorite with many people. Just out of Clarkston WA it is a great spot to take the kids fishing. My friends just bought a house at the top of the canyon you see here. From their place you can see the port and a beautiful view of the Snake River. It has been a beautiful early spring day today around 60 degrees and no rain. After church and a great salad bar lunch at Antonio’s I spent the day with a wonderful new friend enjoying a leisurely walk. Sharing life’s experiences along the way and taking the time to get to know each other. Oreo, my puppy loved the walk too and all the new smells. She was a happy camper. Later we both enjoyed a nap together. One of my personal favorites. 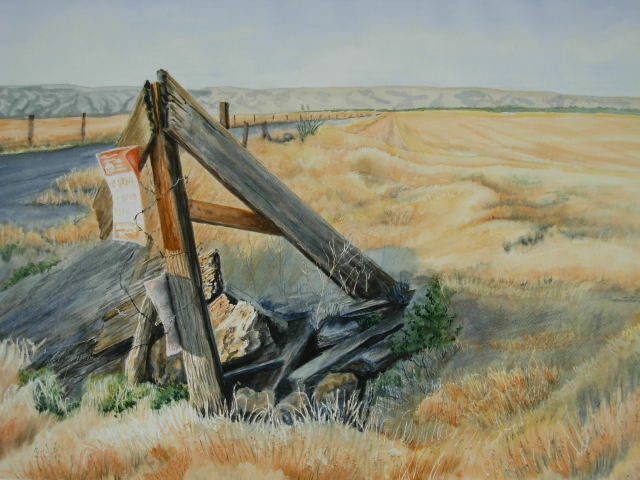 This painting was juried into the Spokane Art Show in 2008. It didn’t win a prise but I was so honored to be among the top artists of the area. A real honor. My daughter loved it so much I gave it to her for Christmas last year and it now resides in California. I will make prints of this one if anyone is interested. The original size framed is 22″ x 28″. 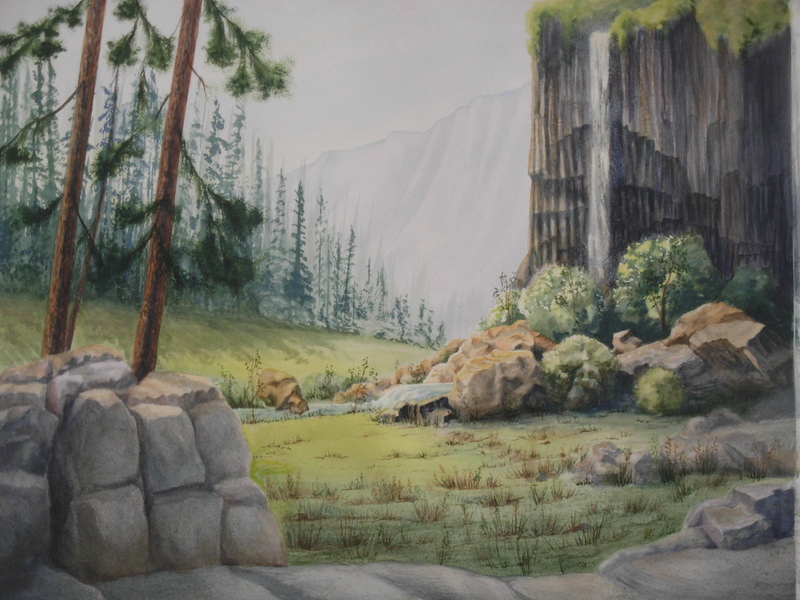 Still working on the waterfall painting. Probably another week or two to finish it. So here I go to work on it.